‘Operation Twist’ – What is it? How could it help? But why will it not? As the US launches $400bn ‘Operation Twist’ in a desperate attempt to kick-start the economy, concerns arise over how effective this will be. It’s true that something needs to be done and inflation restricts the options open to the Fed but the strategy has a poor track record in terms of effectiveness. We will be in a lower growth environment for longer and should prepare accordingly. The US remains driven by consumer spending (~70% of GDP), but weak consumer confidence and limited access to financing are severe headwinds. Unemployment is stuck at 9% and even more worrying are the ‘under-employment’ figures which include those that have been forced to cut their working week rise as far as 18.5% of the population. In addition to discouraging spending, the longer this continues, the more skills are being eroded. Therefore the US government is under an immense pressure to act. So what can they do? When conventional monetary policy has become ineffective, since short term interest rates are already low, that’s where quantitative easing steps in. With the aim of stimulating the economy, the Fed will buy financial assets in order to inject money into the markets. Bernanke has made it clear that one of the pre-requisites is a re-emergence of deflationary risks. However, inflation remains stubbornly above 2%. Pumping more money into the markets increases its supply and therefore reduces its value. With the currency less valuable, it doesn’t go as far as it used to and you get less ‘bang for you buck’. Things seem more expensive and inflation has been boosted. Operation Twist to the rescue? There is hope. 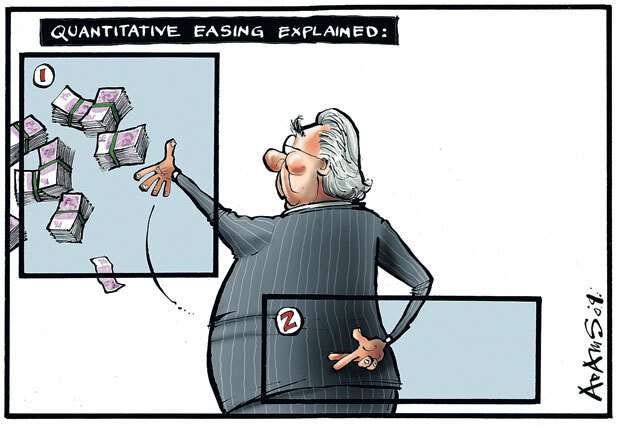 One form of quantitative easing avoids the problem of inflation – Operation Twist. The strategy still involves the Fed buying long term government bonds, but in this case, it’s offset with selling short term bonds. This avoids flooding the market with cash which would exacerbate inflation. Another way this method is also described, by selling short term bonds and buying longer term bonds, is an extending of the maturity of Fed’s bond portfolio. Buying these long dated bonds increases demand and therefore reduces the amount of interest the bond issuer has to offer to entice buyers. A reduced longer term rate makes for example mortgages (long term borrowing) more affordable which would hopefully encourage spending. History teaches that Operation Twist may be of limited use. When it was applied back in 1961, it only reduced rates by 15bps! This would not be enough to encourage spending, hiring and boost the economy sufficiently. Prepare for a lower growth environment for longer. Pay attention to the type of customer a company in which you’re interested in investing services. A strong balance sheet, pricing power and protected demand will serve firms well. Over the last few days we have seen a tremendous amount of volatility in the markets, epitomising the lack of clarity with which many investors have struggled. The contagion continues to spread as we hear rumours of a possible downgrade of French government debt although it is far more likely to occur for Italy first. Fundamentally, there is a lack of a long-term solution and the knee-jerk reaction by some EU countries to ban short selling not only misses the point, it may negatively impact the very stocks it is trying to protect. So as we see movement to safe havens, we also see room for opportunistic buying – as long as you invest with those with strong balance sheets unlikely to be hit in future earnings downgrades and have a long enough time horizon to withstand the volatility. The markets are already betting for the ratings agencies to downgrade France’s debt with credit default swap spreads widening to double their level at the beginning of July. A rising expense to insure against default implies the market believes it to be more likely. However, Italy is the more likely downgrade candidate in the short-term. The reasons given behind Portugal’s downgrade a few months back apply equally to Italy – an unsustainable debt burden (Italy has the third largest in the word at €1.8tn) and a low likelihood of being able to repay these obligations (as it dips back into recession). The European Financial Stability Fund is losing its credibility since even its increase to €440bn is not enough to cover future potential bailouts and would need to amount to at least €2tn. The crux of the problem, as I’ve iterated before, is that you can’t solve the problem of debt with debt and austerity does not foster growth. Instead debt burdens are increasing at a faster rate than GDP growth in many western economies so the situation is only getting worse. European banks remain highly correlated to the future of the periphery. German banks, for example, have exposure to the PIIGS (Portugal, Ireland, Italy and Spain) amounting to more than 18% of German GDP. Commerzbank revealed that a €760m write-down for Greek debt holdings wiped out their entire Q2 earnings. That’s before we look at France who have an even higher exposure and here in the UK, our banks have nearly £100bn exposed to struggling economies. Furthermore, these banks need to refinance maturing debt (at a rate of €5.4tn over the next 24 months) at higher rates and with demand shrinking. The markets are concerned with government fiscal credibility not its regulatory might. Instead, the ban could increase volatility and negatively impact the very stocks it is trying to protect. ‘Shorting’ was acknowledged by the Committee for European Securities Regulators as beneficial for “price discovery, liquidity and risk management” just last year, so we may well see higher volatility than we would have without. Secondly, it limits fund ability to bet on financials going up. Hedge funds use shorts to remove market risk, buying shares in one bank and borrowing and selling shares in another. If they are forced to close these ‘borrowed’ positions, they will have to sell the other bank shares they have bought outright, causing further selling pressure and price falls. Most interesting was the timing of the implementation, just before an announcement was made that the Greek economy shrank by 7% in Q2 – fuelling fears the ban was needed since there’s more bad news to come. So how can you invest in these markets? A possible support to the stock markets is the ‘search for yield’. Sitting on cash can’t be satisfying for long, with rates as low as they are, and the dividend yield on the Eurostoxx is now double the 10 year German ‘bund’ yield. This means that even if markets go sideways, the return generated from holding European stocks could be more attractive than either if the other options. In addition, valuations are looking reasonable, at a near 8x forward earnings. Therefore we may see flows returning to the markets. However, be warned, we are starting to see earnings downgrades and volatility may remain. Therefore invest in companies with strong balance sheets and maintain a medium to longer-term time horizon. 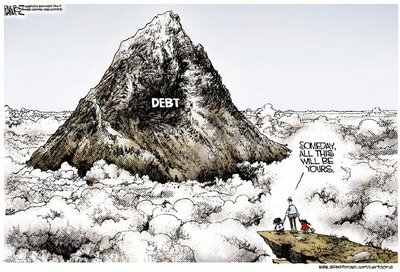 The US Debt Ceiling: The How, Why and What Could Happen? The deadline for delivering a deal to allow the US to continue to borrow and spend, August 2nd, is approaching. Mirroring issues in the EU, a problem of debt cannot be solved by yet more debt. With the threat of a downgrade looming, any rise in interest rates could make the situation worse, hitting the tax payer and US exporters. Moreover, an increase in this ‘benchmark’ rate could impact the UK and hurt our property market, and a weaker dollar could result in job losses in our export sector. Further afield, with China the largest holder of US debt, the concern could spread globally towards countries relied upon to drive future growth. But failing to raise the ceiling isn’t an option and may cause an eventual default further down the line. Therefore, a deal will be struck and a balance found between demands for more spending cuts and aspirations for tax increases. The US debt ‘ceiling’ is the maximum amount of bonds the US can issue, i.e. the maximum amount the US can borrow to finance its spending. The limit is currently set at $14.3tn but with the country spending approximately $120bn more than it takes in terms of revenue each month, after funding its participation in 2 world wars, rescuing the financial system post-Lehmans and pumping the economy with new capital to boost economic growth, the debt limit was reached on May 16. Put another way, the US has maxed out its credit card. 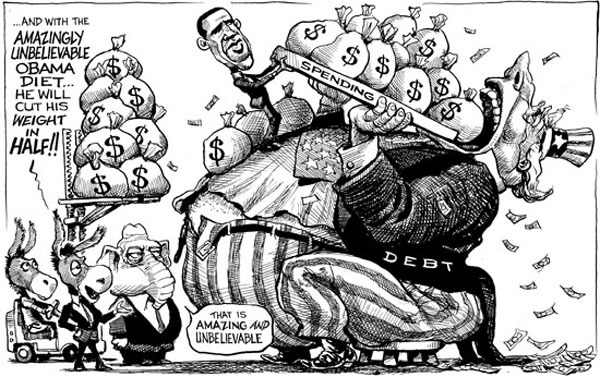 Instigated in 1917, the debt ceiling has in fact been raised 74 times since 1962 alone. It should be noted; raising the limit does not increase fiscal spending but merely allows current obligations to be met and annual deficits to be financed. Nevertheless, in the current environment, with sovereign debt crises in Europe, investors and rating agencies are becoming acutely aware that cannot solve a problem of debt with more debt and the extent to which the ceiling would have to be expanded is troublesome. Obama’s proposed budget will require a ~$2.2tn hike just to meet next year’s obligations. Even if the ceiling is raised, there are other issues to tackle. S&P in April threatened reduce the credit rating of US debt. The importance of this threat should not be underestimated. With a ‘AAA’ status and ‘stable’ outlook’, any downgrade would threaten its role as the safest place to store savings. To retain their position, the US needs to address how it will not only plug this short-term gap, but also meet longer-term challenges. A hit to confidence would increase the rate of interest demanded by investors to compensate for a higher perceived risk of loss. This would increase borrowing costs for the US, worsening their debt burden and further limiting the amount of new debt they would be able to issue. It has been estimated that even an increase of 25 basis points could cost tax payers $500m more per month. With less demand for US treasuries, there would be less demand for the dollar to fund these transactions, making the products the country exports more expensive abroad and again hitting their balance sheet. In its extreme, uncertainty could spark another financial crisis as well as put the dollar’s status as the world reserve currency at risk. (Interestingly, a McKinsey investigation reported less than 20% of business executives expect its dominance to continue to 2025). For this isn’t an isolated incidence. Dollar-denominated US debt is held world-wide (especially $1.1tn by China), spreading the problem towards the very countries many are lauding as growth drivers of the future. There could be dire consequences felt even in the UK. The US is our largest export partner, spending $50bn for our products last year alone. A weaker dollar would damage American buying power, making these products more expensive and damaging demand. This would cause companies producing these goods to suffer and jobs would be lost. Furthermore, if fears over the ability of the US government to repay its debts led to investors demanding more to lend to the UK government, mortgage rates would become more onerous and it could be harder for buyers to purchase a property. With less investors able to buy and therefore lower demand, sellers may be forced to lower asking prices to get a sale. In the near-term, the US could continue to function. Failing to be able to increase borrowing would necessitate spending cuts: to military salaries, social security, medicare and unemployment benefits. Furthermore, some of their debt could be rolled over so long as the overall amount of treasuries outstanding didn’t rise. However, this is unsustainable in the medium to longer-term and would lead to an eventual default. The issue is currently being used as a negotiating chip by Republicans to get deeper cuts and long-term reforms whilst refusing to raise taxes, versus the White House aiming to cap tax exemptions and reduce ‘inequalities’ benefitting big business. Nevertheless, with such serious ramifications possible, it is unlikely a deal will not be struck.